Justin Timberlake recently called Madonna a "mother chucking ninja." Some people in the U.S. were upset, saying the word had racist connotations. In Japan, some folks were baffled by this controversy. Saying "ninja" is basically just a cooler way to say "the 'N' word"; review if necessary the Louis C.K. joke about that phrase, and how saying "the 'N' word" is just "white people gettin' away with saying 'n*****,'" because all you're doing by saying it is making other people think the actual word. Japanese site Walkerplus covered the controversy, which then launched a thread on 2ch, Japan's largest net forum. "Don't drag ninja into this!" wrote one 2ch user. "Naruto must be pissed." "It's sure is depressing to see white people use the word ninja like this," chimed in another. "Once again, Japan is made evil," quipped another. 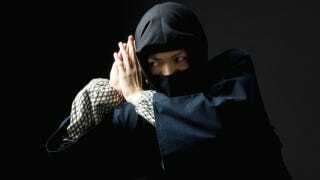 Others couldn't believe that the word "ninja" was discriminatory. "I don't get this at all," said one 2ch user. Others wondered if it was based on color or pronunciation—if so, that makes this coded language most unpleasant. Being 2ch, there were also stupid racist comments, as you'd expect to see on anonymous bulletin boards. However, not all of them were. "Actually, during the subprime crisis, the term NINJA meant "No Income No Jobs Asset" and used," explained another 2ch user. "This really has nothing to do with real ninja," added another commenter, while another commenter wrote, "This makes me angry... It's also dissing Japan." "Alright, just stop using the word 'ninja,'" said one 2ch commenter. Well, better yet, to those using it as coded language, stop? That's one of the depressing things about this. I like ninja! Like, you know, ninja—whether that means the historical ninja or the ninja of popular imagination. I don't want ninja ruined by slurs—whether they are actual slurs or perceived slurs, that's besides the point. Crap like this taints ninja. Intended or not, it draws unpleasant associations to the word. And what is Justin Timberlake even calling Madonna a ninja for? Ninja are about stealth. About sneaking. About listening. Madonna is about being bombastic, gaudy, and showy. That's fine! She's an entertainer. But, there's nothing ninja about Madonna. Nothing at all. And "ninja" is the last thing she should be called.